On July 14, 1940, just over a month after Italy entered the war, two Italian light cruisers became engaged in combat with one Australian light cruiser and five British destroyers off Northwest Crete in what later became known as the Battle of Cape Spada. steaming at high speed during the battle. The Italian light cruisers Bartolomeo Colleoni and Giovanni dalle Bande Nere, Rear Admiral Ferdinando Casardi commanding, were steaming from Tripoli in North Africa to the port of Leros in the Dodecanese Islands, which was Italian territory. The Allied squadron, under command of Captain John Collins aboard the Australian light cruiser Sydney, accompanied by British destroyers, Havoc, Hero, Hasty, Hyperion, and Ilex, were patrolling in the Aegean sea. Italian light cruiser Giovanni dalle Bande Nere at sea. the Battle of Cape Spada. bow to a torpedo hit. At approximately 7:30 AM, the Italian vessels spotted four of the British destroyers and altered course to engage them in a running fight. 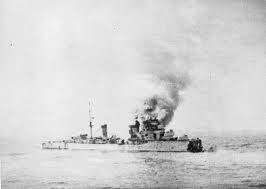 Unknown to the Italians, since they had no airborn reconnaisance, the Australian cruiser Sydney and a fifth destroyer, the Havoc, were only forty miles distant, and the British destroyers were luring the Italians within range of the Sydney. 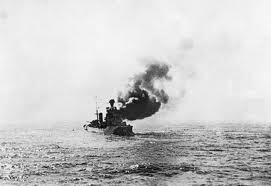 Contact between the opposing cruisers was established at 8:26 AM, and the Sydney commenced firing on the Italians three minutes later. The Italian admiral immediately turned away from the Sydney and her consorts and steamed to the Southwest. 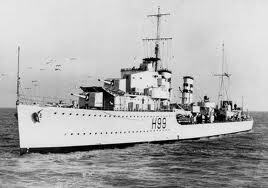 Each of the Italian cruisers matched the Sydney in firepower. All three cruisers mounted a main battery of eight, 6-inch guns and each carried torpedo tubes. 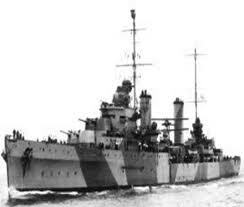 The Italian cruisers were also reportedly at least 6 to 8 knots faster than the Sydney, but of much lighter construction than the Australian ship. Theoretically, the Italians, utilizing their advantage in speed, should have been able to make good their escape, but it was not to be. Being launched in 1930, the Italian cruisers were somewhat older than the Sydney, which was launched in 1934, and their initial trials during which their high speeds had been achieved were done with only light load displacement, without stores, ammunition, or all equipment on board. Under fully loaded operational wartime conditions, the Italian ships were only slightly, if at all, faster than their Australian counterpart. 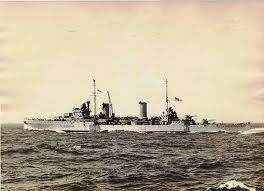 Australian light cruiser Sydney at sea. The Sydney's gunfire proved to be more accurate than that of the Italians. 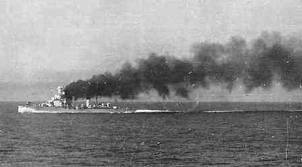 During the running fight, the Sydney concentrated her fire on the Bartolomeo Colleoni, scoring several hits. By 9:23 AM, the Bartolomeo Colleoni was dead in the water, having been hit by a shell in the boiler room and lost power. The Giovanni dalle Bande Nere initially turned back to offer aid and assistance to her sister ship, but quickly realized that, now facing the Sydney and the five destroyers alone, she was completely outgunned and outnumbered. 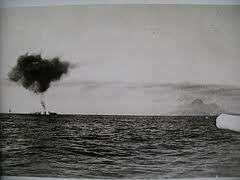 She then turned and fled, under fire from the Sydney. The Sydney achieved two hits on the Giovanni dalle Bande Nere, but did not stop her. In return, the Sydney was only hit once in her funnel, which did nothing to impair her fighting efficiency. The Giovanni dalle Bande Nere made good her escape. The British destroyers now had their turn with the helpless Bartolomeo Colleoni. By 9:59 AM, the Bartolomeo Colleoni had lost her forward bow as far back at the number one turret as the result of a torpedo hit. Destroyers Ilex and Hyperion finished off the Italian cruiser with three torpedoes. There were 121 casualties aboard the Bartolomeo Colleoni, while 555 of her crew were rescued from the water by the British destroyers. 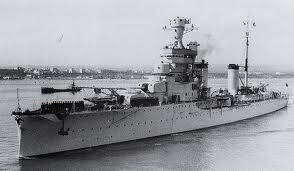 The British battleship Warspite was in the general area and utilized her float plane to attempt to locate the fleeing Giovanni dalle Bande Nere, but did not find her. Later in the day, the British destroyers were attacked by Italian aircraft, and the Havoc sustained damage to her boiler room. she appeared later in the war prior to her sinking in March, 1942. The Giovanni dalle Bande Nere continued the fight against the Allies in the Mediterranean until March 22, 1942 when she was sunk after being hit by two torpedoes fired by the British submarine Urge. The Sydney was lost on November 19, 1941 in the Indian Ocean near Australia when approaching the disguised German commerce raider Kormoran, which was posing as a merchant ship. During an exchange of gunfire at point blank range, both ships sustained fatal damage and sank some distance apart.